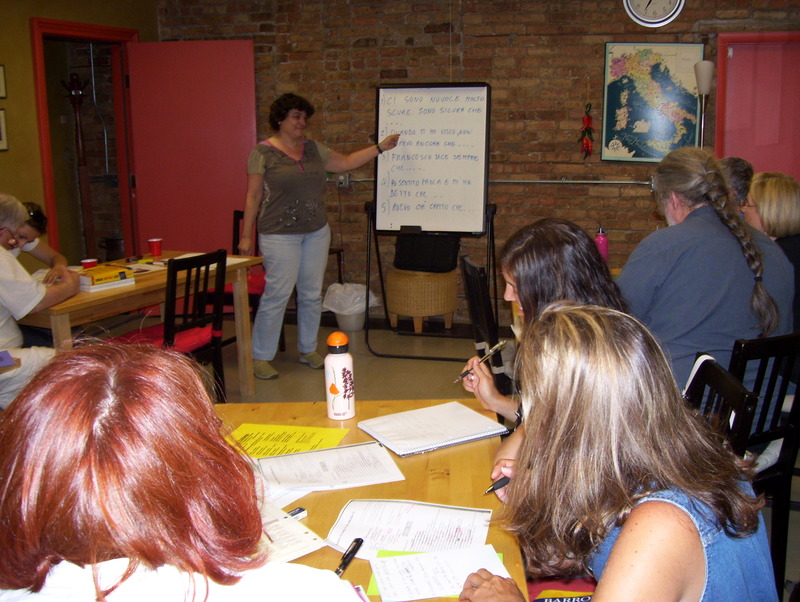 Our Italian language classes use a communicative approach incorporating listening, writing, and conversation. Classes are organized around challenging and interesting topics and are structured to provide the insight needed for students to achieve fluency. Class discussions are lively and engaging and combine the best of both worlds — high academic standards and a friendly community setting. There are classes for all levels of students, whether you are just starting out or you are already conversational. We will work with you to help select the class level that best matches your level of language competency and meets your personal goals. First year basic courses cover grammar including articles, present and past verb tenses, prepositions and pronouns. Listening, writing and conversation exercises will have you speaking Italian in the first year! Basic 1 – Saturdays, 1:00–3:00 p.m. Basic 2 – Tuesdays, 6:30–8:30 p.m. Basic 3 – Thursdays, 6:30–8:30 p.m. Basic 4 – Wednesdays, 6:30–8:30 p.m.
Year two students. Intermediate courses focus on building a higher-level vocabulary and grammar including combined pronouns, advanced verb tenses, and idioms. New students can join our second year program provided that their previous studies have covered basic grammar. Intermediate – Mondays, 6:30–8:30 p.m.
Advanced courses continue focus on building a higher-level vocabulary and grammar including combined pronouns, more advanced verb tenses, and idioms. New students can join our advanced program provided that their previous studies have covered basic and intermediate grammar. Advanced – Saturdays, 10:30 a.m.–12:30 p.m. These courses are taught at five different levels: Conversation 1, Conversation 2, Conversation 3, Conversation 4 and Book Club. They are for students who have had at least three years of formal language instruction. We stimulate conversation with advanced textbooks, film excerpts, newspaper articles, short stories, and cultural materials that emphasize Italy’s current events. New students should have a minimum of three years of outside study. The most advanced conversational group and book club is comprised of students with at least five years of experience. Conversation 1 – Tuesdays, 6:30–8:30 p.m. Conversation 2 – Thursdays, 6:30–8:30 p.m. Conversation 3 – Mondays, 6:30–8:30 p.m. Conversation 4 – Wednesdays, 6:30–8:30 p.m.
Book Club – Fridays, 10:00 a.m.–12:00 p.m.
New students, please call us at 773.275.5325 to inquire about registration. Minimum of 8 students per class. Note: Materials are not included. If required for your course, material prices will be sent with your course confirmation and will be payable by cash or check at the first class. Sentieri Italiani provides group classes, semi-private lessons and private tutoring for students for both adults and children. Whether you are attending group classes or working with an instructor one-on-one, you will find our approach highly professional, creative and energetic, and your learning experience filled with fun. Sentieri’s salon-like setting is intimate and relaxed. Don’t be surprised when you hear the hissing of the steam from the espresso machine or the pop of a cork! Sentieri Italiani offers a preparation course for the Certification of Italian as a Foreign Language (CILS). The CILS exam offers non-Italians the opportunity to test their proficiency in Italian and receive an official designation of their level of linguistic competency. Certification is awarded by the Università per Stranieri di Siena and is recognized by the Italian Government on the basis of an agreement with the Italian Ministry of Foreign Affairs. The CILS exam takes place at DePaul University, Department of Modern Languages twice a year, in June and December. How do you determine my Italian language ability level?